They told him he was a psychopath, and he thought they were joking. What would you do if your brain scan showed you were a psychopath? I’ve just finished reading ‘The Psychopath Inside’ by James Fallon (Penguin, 2013, 246 pages.) Fallon was a neuroscientist studying the brain scans of psychopaths: serial killers with no conscience and no empathy. Co-incidentally, he had a folder with brain scans of all his own family members, which he had obtained (with their consent) because, for another study, he needed an entire family in which no one currently had Alzheimer’s disease. Psychopaths all have certain abnormal features in the very front of the brain: the parts that deal with empathy and conscience. One day looking through his scans, he found one which had the exact features of a psychopath, but was in his family’s folder. Since the scans had numbers rather than names, he asked his research assistant to check who it belonged to, thinking the two sets of scans might have gotten mixed up. They hadn’t. The scan was his. Fallon had never murdered anyone in his life, and never tortured animals as a child. So what was he doing with a brain scan that showed these types of abnormalities? 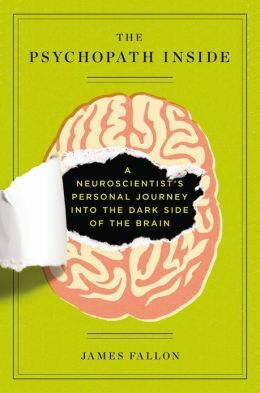 The remainder of Fallon’s book is an exploration of why some people become psychopaths and some don’t. Fallon concludes that although he has the physical brain abnormalities of a psychopath, he was stopped from growing in that direction by the loving home environment in his early childhood – something other psychopaths usually didn’t have. Nevertheless, he does show some psychopathic traits. He has exposed other family members to extreme danger, taking his brother camping at night in an area frequented by elephant herds without telling the brother what they were doing. Why? For the thrill of it. If someone offends Fallon, he doesn’t tell them straight away, but will wait for three or four years before springing some revenge on them, at a time they have entirely forgotten about the original incident. And he admits to not going to family funerals or graduations because he just felt there was something more interesting on – such as a chance to go gambling. work colleagues had told him over the years that he was a psycopath in the workpace, but he thought they were joking, or just disgruntled about something he had done, and he had dismissed their claims. Fallon presents a rare portrait of himself, warts and all. For those who have an interest in psychology, or the nature-vs-nurture debate, this is a very interesting read. So, what about you? Do you know people who all the advantages in early life and turned into very unpleasant people? Or who had appalling early lives and turned into nice people? Do you think we are any closer to solving the nature vs nuture debate?